Get ready to meet one of the most famous families in American cartoon history! That’s right - The Simpsons are here and they can’t wait to attend your next kids’ party. Say ‘hello’ to Homer, Bart, Lisa, and Marge - all thanks to our Simpsons bouncy castle. You will surely have a blast playing with your kids and guests for hours on end. Plus, you need not worry about safety, because all of our bouncy castles are perfectly safe and reliable. For just £70, you get a whole day of fun. And for a measly £20, you can extend that fun overnight! Setup is quick and easy, too - it will take less than 10 minutes for us to install the whole shebang, and have you start your party. We’ll also take care of collecting all equipment after the celebration. 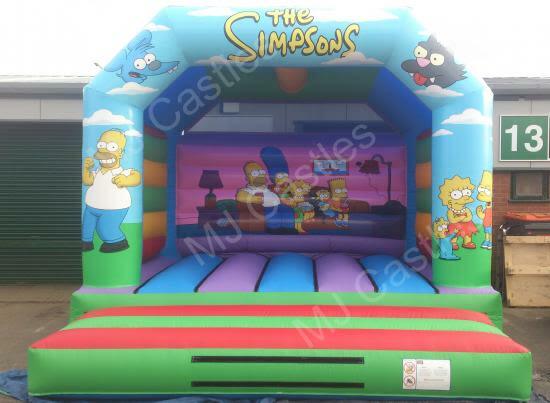 Give your kids a party they won’t forget for a long, long time with a Simpsons bouncy castle! The castle measures 16ft x 16ft, and comes with a rain cover to keep the fun going even if it pours down. Fill up the Contact Form for any queries. You can also drop us a call, or email for more information on how to hire a bouncy castle for your next party.